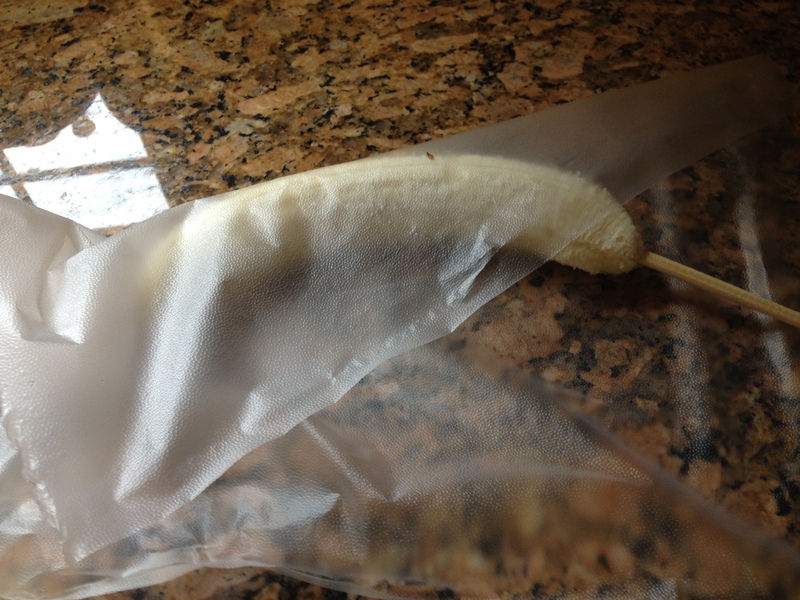 My first experience with a frozen banana (that sounds wrong…) was at Disney’s California Adventure in 2005. It was my daughter’s first trip to Disney, and it was her 4th birthday. I was still zealously careful about what she ate at that point (No junk food for my kid! 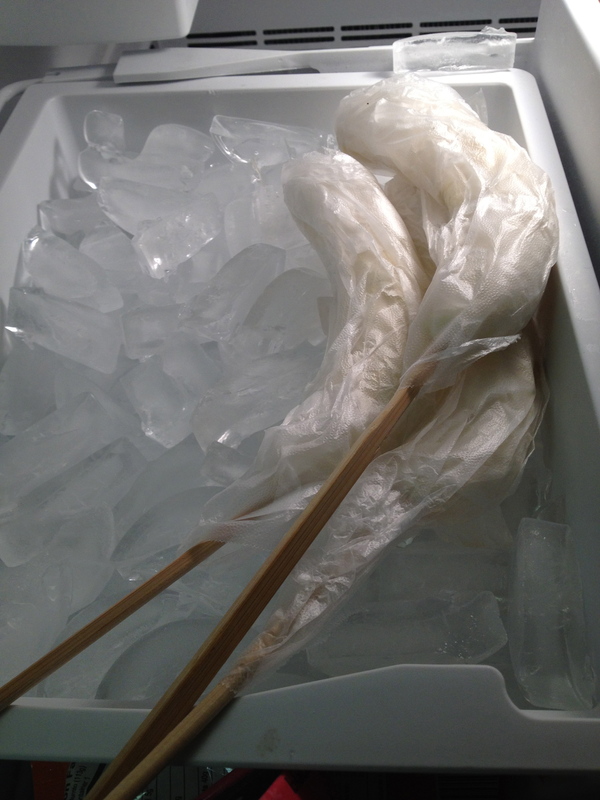 Yeah, right…) So when I saw the frozen bananas, they seemed like the perfect treat. The version with no chocolate or peanuts, of course. So yesterday on a whim, and without instructions, I decided to try my hand at making them. I have bananas. I have a freezer. How hard could it be? Well, not very hard at all as it turns out, but the result was not exactly like being in Disney. But that’s OK. Advice – start with less-ripe bananas. I used what was on hand, and they were a bit softer than ideal, and a little harder to work with. Something to skewer them with. I suggest chop sticks or cake-pop sticks. 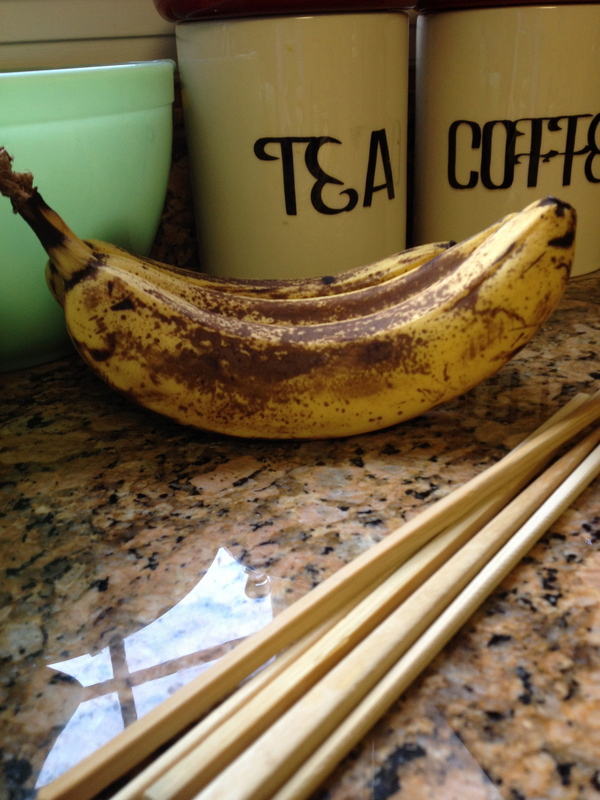 The thin bamboo skewers you might have around for the grill are too thin and won’t hold the weight of the banana. 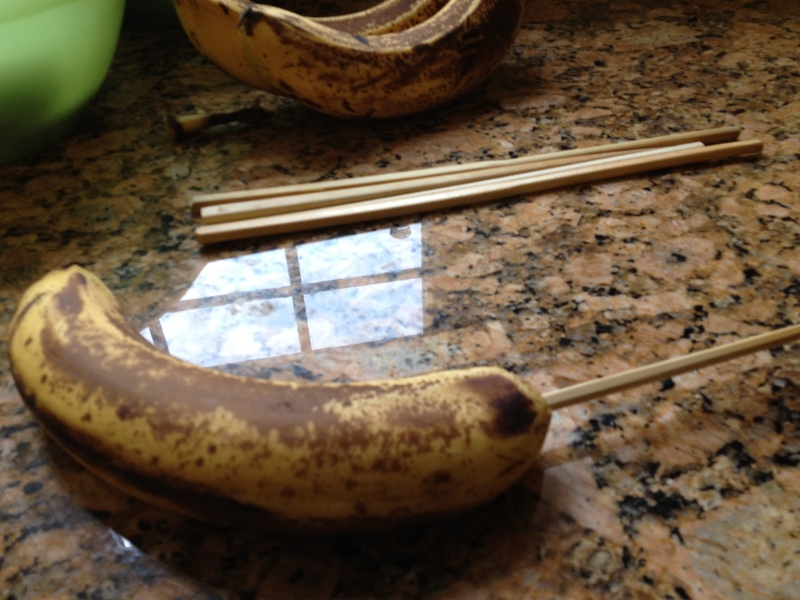 First, remove the stem of the banana, keeping the peel on. 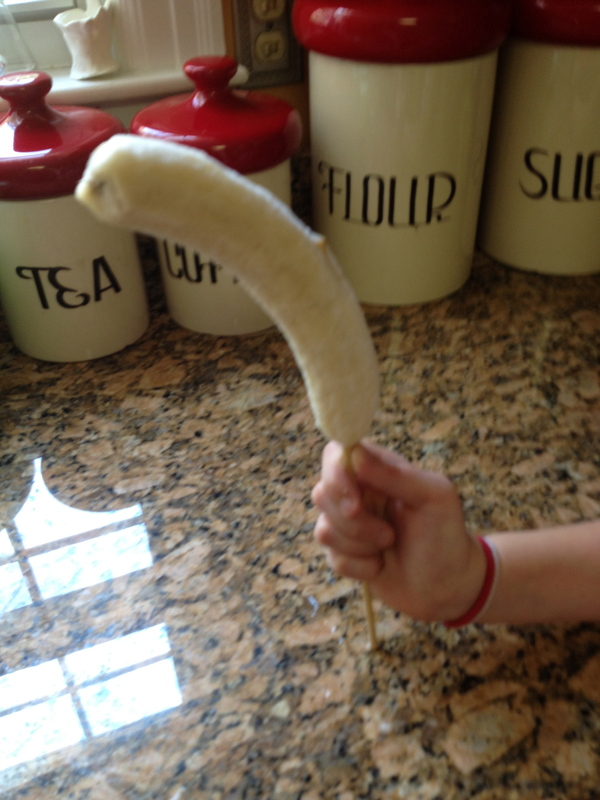 Then, skewer the banana, pushing the stick as far as you can go before hitting the curve. You don’t want the stick to poke out. Next, peel the banana, and wrap in plastic. I like the kind that’s more like sticky wax paper. Be sure to make them airtight to keep them from turning yellowish-brown. Finally, pop them in the freezer, and wait a few hours. I placed them in the ice tray, hoping that would speed up the freezing process. Finally, take them out and enjoy! Not a bad use of bananas that are about to get too ripe! Normally I throw them into the freezer (unpeeled), and defrost when time to make banana bread. Another word to the wise – eat them right away. Defrosted bananas get mushy fast. Have you tried to make Disney treats at home? Share your story in the coments! Hah – that totally works! I’ve also been getting pineapple frozen yogurt lately and pretending it’s a Dole Whip. Your posts make me miss Disney World! I miss Disney World, too!